April 22nd is International Earth Day ! Did you know that "Pachamama" literally translates to Mother Earth ? But to the indigenous people here in the Andes, it means deeper & meaningful connections with the universe, earth, sky, and time. Mercados in Cuenca are bustling, vibrant, bountiful, centres of economic activity - a profound experience to awaken all your senses. Indoor and outdoor scattered throughout the city offering a wide range of goods and services. New to Cuenca we are fascinated with the number of fresh market options available for mother earth's bounty. 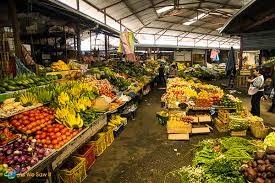 The volumes (literally tons), and the diverse range of fruits, vegetables, dairy products, fresh meat & seafood, grains, nuts, spices and other services available at the local markets. Over 12,500 licensed vendors, and many more unlicensed vendors, operate throughout the city in the markets listed below. Not being able to find a practical reference list we have prepared a list of these markets, their location / addresses, and their unique offerings or specialties. We hope it is of value and will endeavor to keep this list current, and updated. We would appreciate any additions, or pearls of wisdom from those who have more experience in Cuenca. Open every day from 7:00 a:m to 6:00 p:m, this is Cuenca's largest and busiest market. Sprawling over several city blocks are covered arenas, specific purpose sheds, indoor stalls, and outdoor stalls. Not for the feint of heart, it can be overwhelming, and very easy to get lost for the first time visitor. People from surrounding farms & villages visit on Wednesday & Saturdays, creating an even busier atmosphere, and larger market sprawling over five hectares. As the Azuay province's primary wholesale agricultural marketplace, with well over 6,000 vendors it is a fascinating experience - colourful, and busy. 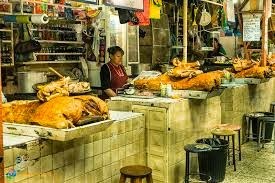 This market has flowers, fruits, vegetables, dairy products, variety of eggs, grains, nuts, spices, aisles of vendors selling roasted pig, cuy (guinea pig), fresh chicken, ducks, or geese, several areas for fresh meats, several sections for fresh seafood. Outdoors is a live animal area with geese, ducks, chickens. roosters, turkeys, guinea pigs, rabbits, dogs, cats, budgies, cockatiels, goats, pigs, cows, and a variety of other live animals. 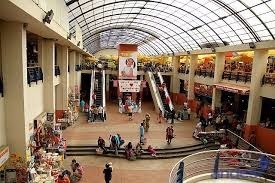 An enormous indoor maze of compact tiendas has dry goods, clothing, shoes, outerwear, underware, linens, Ecuadorian handicrafts, tools, cellphones, electronics, household items, cookware, staple groceries, toys, plasticware, hardware, wood products, music cds, watches, souvenirs and much more ! Services include restaurants serving typical local food, and food and beverage vendors, duplicating keys, appliance repair, barber shops, and banks. The market is located at El Arenal, one of two major transfer stations where most local bus routes converge. Open daily from 10:00 a:m - 8:00 p:m except Sundays. This is Cuenca's oldest market specializing in the commercial sale & distribution of grains and dried corn & beans. Remodeled in 2004 it is two floors and one of our favourite. An industrial metal structure featuring natural light, open air spaces & balconies - reminding us of the popular Robson Street Market in Vancouver, B.C. For some reason it is not very popular and currently has 132 vendor stalls occupied out of 223 available stalls (only 60 % occupied ) . In addition to its open style, there is more labeling and pricing than other markets. The attraction for us is it is not as busy, and vendors have additional time to explain and answer our numerous questions. This market has fruits, vegetables, dairy products, grains, nuts, spices, dried beans & corn, meat, poultry, seafood, basic groceries, traditional food, coffees, ice cream and fresh juice bar. It has an interesting ecological vendor making and selling recycled tires made into a variety of decorative planters, and hanging flower pots. One of the city's largest & best ferreteria's for selection and price is Ferreteria Vasquez Brito right across the street. Operating daily from 8:00 a:m this market is one of the oldest, a three floor traditional mercado was refurbished in 2009 to be modern, clean and spacious. It has a very high sales volume. Located in an area once considered unsafe, dirty, and plagued with social problems of poverty and prostitution it has now been cleaned up and presents a new public face. A fantastic selection of fresh fruits, vegetables, plants, variety of herbs, crafts, and clothes. Traditional foods are available on the third floor. This market's known specialty is practicing Shaman healing rituals and medicinal herbs and plants. Operating daily from 7:00 a:m this traditional 90 year old mercado is one of Cuenca's major and most popular markets. It's facelift makes it the only market in Cuenca with an elevator and escalator. Housing 630 vendors it also provides free parking. Providing an environment and real Cuencan life experience this market has fruits, vegetables, dairy products, grains, nuts, spices, dried beans, meat, poultry, seafood, basic groceries, clothing, wicker items, traditional foods, ice cream smoothie juice bar, and medicinal herbs & plants. Operating daily from 9:00 a:m One of the newer farmer's type markets primarily with fresh fruits and vegetables. Operating daily from 8:00 a:m to 4:00 p:m This 32 year old enclosed market is a centre of supplies for the area with fruits, vegetables, dairy products, dried fruits & nuts, spices, meat, poultry, seafood, basic groceries, and traditional foods (wonderful cerdo hornado & ceviches) clothing, footware, toys. With free parking, this market is said to have great prices. Open daily 8 am - 5 pm an outdoor block of clothing, shoes, cookware, kitchen utensils, wicker, ceramics, ironworks. and plastic trinkets. Most noted for its religious paraphernalia and the Otavalen weavings, sweaters, scarves, blankets, panchos, skirts, dresses, and beautiful hand embroidered blouses and shirts. Opening daily at 9:00 am - operating through to 6:30 pm Monday to Friday; 5:00 p:m Saturday; 1:00 p:m Sunday A more formal collection of 100 artesans in an indoor area on the western side of Plaza de San Francisco. You will find stained glass, paintings, ceramics, embroidered clothing, wooden carvings, weaving, handmade musical instruments, unique gifts, jewelry, typical Ecuadorian crafts, and much more. Plaza Rotary (Mercado de Atesanias Rotary) - Plaza Sangurima on Gaspar Sangurima y Vargas Machuca. Operating daily from 8:00 a:m also known as Plaza Civica. One of our favourite artesan markets for practical household items, wooden furniture, wicker, iron works, bar-b-ques, tinsmiths, clay pottery, and a wide assortment of artesan crafts. Open daily in El Carman Square for a rich and colourful selection of flower arrangements, roses, and a wide variety of local plants and flowers. Artesan stalls with a variety of jewelry, and small handicrafts. Open daily from 8 am - 5 pm. Basketry, ceramics, ironworks, kitchen utensils and bright plastic animals. La Esquina de Las Artes - El Barranco on Av. 12 de Abril y Agustin Cueva. Open Monday to Saturday from 10 am to 7:30 pm and Sunday from 10 am to 2 pm. A commercial centre for promoting the arts with distinguished artesans showcasing ceramics, glass, wood crafts, textiles, embroidery, jewelry, and more. On Saturdays from 5 pm to 6 pm, enjoy live music and folkloric dances. On Thursday mornings a great opportunity to purchase a hand woven hat from craftsmen in the area. Open on Saturdays 6 am until noon but you can expect many things to be gone very early. A few of the vendors are also there on Wednesdays. Cuenca's newest organic farmers market where 200 stalls offer vegetables, fruits, grains, bread, herbs, plants, clothes, crafts, and other offerings direct from the producers and craftsmen. Support your local entrepreneurs and save money with competitive prices. Now open on Sunday mornings as well. 2.) This market is located near El Tiempo which is on Av. Lola. 3.) On the corner of Las Americas y Avenida Mexico where the annual carnival is located. Vendors selling honey can be found here. 4.) San Joaquin Coopera Farmer's Market - about two miles along the Cajas autopista. 6.) Gran Sol Coopera Farmer's Market has multiple locations.